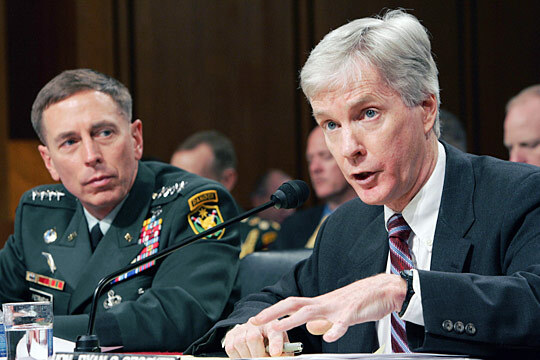 Frustration Evident as Officials Grilled on Iraq Gen. David Petraeus and Ambassador Ryan Crocker faced tough questioning Tuesday from senators on both sides of the aisle who were clearly frustrated by the slow pace of progress in Iraq. "There is an enormous amount of dysfunctionality in Iraq," Crocker acknowledged. Gen. David Petraeus and U.S. 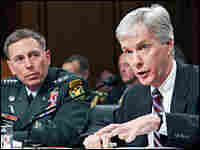 Ambassador to Iraq Ryan Crocker testify during a joint hearing on Capitol Hill on Monday. Crucial to whether Gen. David Petraeus' Iraq assessment lands with applause or a thud are eight Senate Republicans who broke ranks with President Bush over the summer. All eight hail from states where the war is unpopular; half face tough re-election bids in 2008. On their second day of congressional testimony on the situation in Iraq, Gen. David Petraeus and Ambassador Ryan Crocker on Tuesday largely reprised their opening statements from Monday, when they appeared before members of the House. But this time, America's top commander and top diplomat in Iraq faced more intense grilling from a generally more skeptical audience — and, troubling for President Bush, some of the toughest questions about the war in Iraq came from Republican senators. "Are we going to continue to invest blood and treasure at the same rate we're doing now? For what?" asked Sen. Chuck Hagel (R-NE), who supports legislation setting a deadline to bring troops home. "Americans want to see light at the end of the tunnel," said Sen. Norm Coleman (R-MN). Over two days of testimony, Petraeus has said that the American troop presence in Iraq —currently at 160,000 — could be reduced by about 30,000 by next summer, and that the military goals of the current "surge" have largely been met. Crocker, meanwhile, has warned that the political situation remains unstable. During Tuesday's testimony, the two men refused to be pinned down on when the situation in Iraq might allow for an end to the U.S. military commitment there. President Bush, meanwhile, plans to address the nation in a televised speech at 9 p.m. Thursday EDT. According to the Associated Press, citing unnamed administration officials, the president plans to follow Petraeus' recommendations on reducing the U.S. military presence in Iraq, but will condition troop cuts on continued progress. The White House plans to issue a written status report on the so-called "surge" Friday, officials told the AP. At times, Tuesday's hearing resembled a presidential debate, as Petraeus and Crocker sat opposite a number of senators vying for their party's nomination: Republican John McCain (AZ), and Democrats Hillary Clinton (NY), Joseph Biden (DE), Christopher Dodd (CT) and Barack Obama (IL). They peppered Crocker and Petraeus with questions and, more often that not, diatribes. "We are now confronted with the question: How do we clean up the mess and make the best out of a situation in which there are no good options, there are bad options and worse options?" Obama asked the general and the ambassador. In another exchange, Biden tried to pin down Crocker on an expected timeframe for concluding the U.S. commitment in Iraq. "You're saying the process will not be quick," Biden said. "Are you talking about not quick meaning a timeframe of a year; or are you talking about not quick being well beyond the end of next summer?" 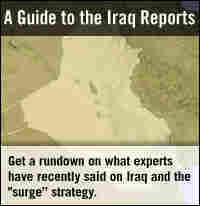 The ambassador replied that it "could be well beyond the end of next summer," and then added, "It certainly will be well beyond the end of next summer before Iraq can achieve the end state I've laid out." As a showdown with Congress over his war policy looms, President Bush is counting on several key Republican senators. Yet tough questions at Tuesday's hearing suggest that their support may be eroding. Sen. John Warner (R-VA), one of his party's most respected voices on military matters, expressed doubt about the "bottom-up" approach to military and political progress that the White House has touted lately. "We have to have top-down, not bottom-up reconciliation," he said. One of the most critical GOP senators was Chuck Hagel of Nebraska, who recently announced he will not seek re-election next year. Hagel spent several minutes questioning "the disconnects" in the findings of several recent reports on Iraq. And he also questioned the value of using U.S. troops to "buy time" for an Iraqi political reconciliation process that has made little progress. But as other senators did on Tuesday, Hagel tempered his criticisms of war policy with praise for the general and the ambassador. "It's not your fault, general," Hagel said. "It's not Ambassador Crocker's fault. It's this administration's fault." Hagel was one of several GOP senators on the panel to express doubt that extending the U.S. military commitment in Iraq would necessarily yield results. "As policymakers, we should acknowledge that we are facing extraordinarily narrow margins for achieving our goals," said Sen. Richard Lugar (IN), the ranking Republican on the Foreign Relations Committee. Crocker, meanwhile, stressed that political negotiations in Iraq were beginning to yield results, after a period in which the Iraqi government had been "basically dysfunctional." "There is an enormous amount of dysfunctionality in Iraq. That is beyond dispute," he acknowledged, adding that change was occurring gradually. Yet he also cautioned against leaving a power vacuum in Iraq. "An Iraq that falls into chaos or civil war will mean massive human suffering — well beyond what has already occurred within Iraq's borders," Crocker said, repeating a warning he made Monday. The ambassador said political stability could not be achieved in Iraq without reconciliation between the country's Sunni and Shia Muslim factions. When asked whether that could happen before the end of President Bush's term in office, Crocker offered "no timelines or guarantees," but said he could point to "some hopeful signs." Sen. Obama said he feared the bar had been set "so low that modest improvement" in the political situation was now considered success. "And it's not. This continues to be a disastrous foreign-policy mistake," he said. Obama then pressed the question of a timetable for withdrawal, asking Crocker if he could see "any point, any benchmark, any scenario" that would signal it was time for U.S. forces to leave. Crocker again would not be pinned down. Petraeus, too, showed some irritation with the question, telling one senator that he was "as frustrated with the situation as anyone else."